If you're a writer embarking on a new work beware of reading anything by Adrian McKinty. His prose is so hard, so tough, so New York honest you'll find yourself taking a knife to your work. He is a cross between Mickey Spillane and Damon Runyon - the toughest, the best. After the blurb got attached to the book funny things started to happen. Simon and Schuster announced that they were going to bring out a paperback edition and wanted to know if I had any other books up my sleeve. Then I got an English publisher, Serpent's Tail. Then I got a French publisher, Gallimard. I even got a Russian publisher. The book was optioned (briefly, but even so) by Universal Pictures and in the autumn of 2004 it was short-listed for a Dagger Award. Frank McCourt passed away on Sunday and I'm not saying that I owe my entire career (such as it is) to him, but I do think he gave me an adrenalin shot to the heart when I was flatlining. 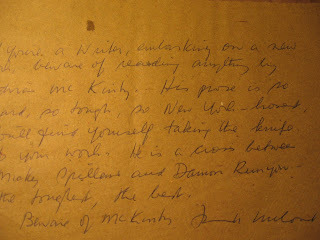 The blurb was unsolicited and completely out of the blue, McCourt merely wanted to help out a young writer, just as he helped out his friends, colleagues, and especially students for 50 years in New York City. RIP Francis, I owe you and I'll miss you. Incidentally the blurb came to Simon and Schuster's offices in long hand and apparently was written on one of McCourt's old grocery bags. They had to call him up and ask if he'd really sent it. He said he had. I asked them if I could have the grocery bag with the blurb on it and they sent it to me.